You are here: Home / Money / Business / Two Economic Systems; Rep. Alexandria Ocasio-Cortez Choose Wisely. Two Economic Systems; Rep. Alexandria Ocasio-Cortez Choose Wisely. 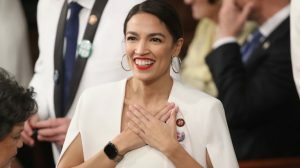 (ThyBlackMan.com) My most recent column brought out some crazies, largely due to the attention-catching headline that included a reference to Rep. Alexandria Ocasio-Cortez, the youngest member of Congress. For the record, columnists do not write headlines. That is the job of the editor or another specialist. My column was about the Girl Scouts and my dismay over the sharp left turn taken by the organization that was an important part of my youth. Scouting used to be about God and country. Now country has been replaced by internationalism, and God in the Girl Scout Promisehas an asterisk, meaning you are free to substitute anything for the great I AM.